Mrs Dragon's Den: Hooray! Hooray! Hooray! 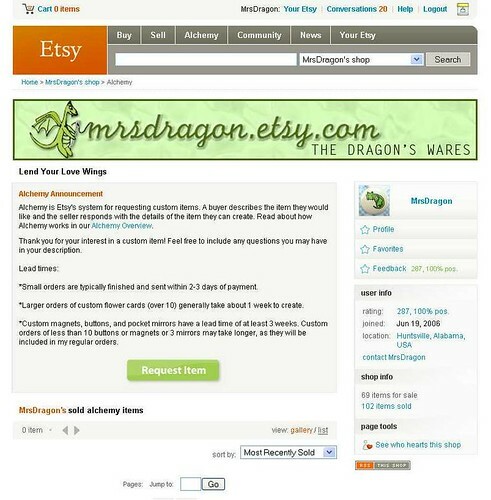 For those of you who are not in the Etsy loop, or who joined Etsy after Nov '06; Alchemy was a neat little feature that let people request handmade items. So, say I wanted a dragon bookend. BUT, I can't find one on Etsy. And I'm not really sure what materials I want or which sellers do custom orders or anything. But I know I know what size I need and how much I want to spend. I would go to Alchemy and say what I wanted and people would put in "bids" saying what they would do and for how much. As a seller it was a great way to get buisness. As a buyer it was customization nirvana. The interface was a little clunky, but it was a golden concept. Well, in Nov '06, Etsy transitioned to "Version 2". Essentially, they came out of Beta. And at that time, they removed Alchemy to make "a few tweaks". A year and a half later, Alchemy came back today and OH BOY is it slick! The interface is well integrated into individual shops--each seller gets an alchemy specific "storefront"--and allows for private (directly to just one seller) and public requests. There are currently still some bugs (like with any newly released code) but the essential elements are working. I used to sell back then :) and I remember that alchemy button and boy was it great. I am glad I have decided to open my store again soon. I posted about this, too! So exciting!